*Disclosure: This post was done in partnership with Wonderful Halos and these opinions are 100% my own. We LOVE Wonderful Halos! They are almost always in our fridge and sports coolers. My kids take them in their lunches at least a few times a week and they know that they are always welcome to grab them as a snack. 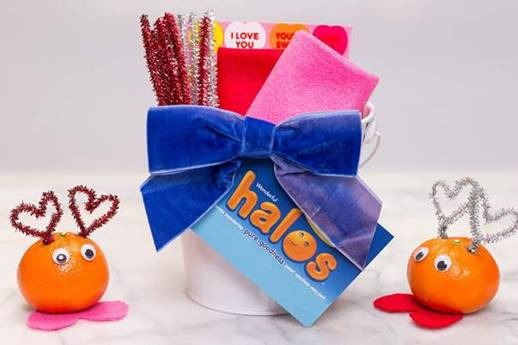 IIt turns out, they also make darling little Valentine’s Day gifts … what a sweet way to give a treat to someone, right? Our friends from Wonderful Halos sent us a fun little activity kit so that we could share these sweet mandarins with family and friend. I love that these are a non-candy option and a fun way to share a sweet message on Valentine’s Day. I’ve shared with you many times before how much we love these little mandarins, including how we love Wonderful Halos in our Easter baskets. I love that this little craft is something that is quick, easy and affordable and something that can be enjoyed by all ages. My daughter is making these for her teachers and coaches this year as a way to brighten their day and put a smile on their face! Who doesn’t love a sweet little treat during the day? In the morning as a refreshing snack. The Little Love Monsters are a really cute (and healthy) idea! The best time is a midday snack. But we snack on them all day. We snack on Halos all day. I love to snack on Halo's all day long. Love them! Whenever they are in the house! We love Halo's!!! Thanks co much for the chance! My favorite time to snack on Halos is the afternoon. I. love to snack on Halos in the evening when I watch television. Question that is be off the topic of this post, but I saw on your Easter post from last year where stickers were used on the Halos. Where can I get these?